Do your shopping at Fremantle Markets and Nosh Gourmet Food & Gifts. 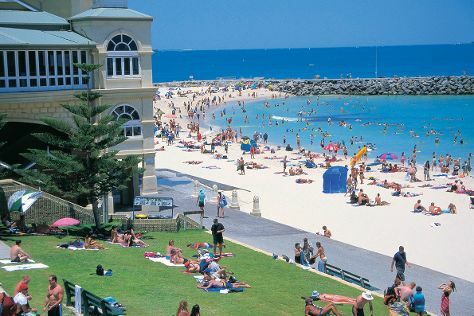 You'll get in some beach time at Cottesloe Beach and Warnbro Beach. You'll find plenty of places to visit near Perth: Caversham Wildlife Park (in Whiteman), Fremantle Prison (in Fremantle) and Dolphin & Whale Watching (in Mandurah). Dedicate the 27th (Thu) to wine at some of the top wineries in the area. There's lots more to do: explore the activities along Swan River, admire the natural beauty at Kings Park & Botanic Garden, steep yourself in history at The Perth Mint, and appreciate the history behind Kings Park War Memorial. For other places to visit, traveler tips, photos, and more tourist information, read Perth day trip website . If you are flying in from Malaysia, the closest major airport is Perth International Airport. In February, daily temperatures in Perth can reach 38°C, while at night they dip to 20°C. Wrap up your sightseeing on the 29th (Sat) to allow time to travel back home.